John Gunn Badnigue Dunbeath died 8th September 1907 aged 65.
d Mary Jane Gunn died at Bannockburn 15th April 1914 aged 17 interred there. d Ann Macleod Gunn died 1st November 1917 aged 25.
d Barbera Gunn died 21st April 1918 aged 24. Son William Gunn died in England of wounds 1st November 1918 aged 30. Wife Donaldina Allan died 13th August 1936 aged 75. 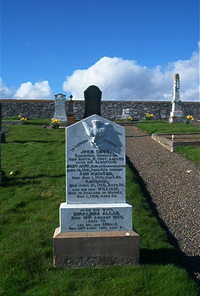 Son Donald Gunn died 30th April 1951 aged 61.